Born 1914, New York City; died 1997, New York City. Born and raised in the Bronx until his family moved to an apartment on Sullivan Street near Washington Square Park when he was five years old, Fasanella grew up in an Italian-American working-class family. His parents immigrated to the United States in 1910, his father finding work as a longshoreman and an ice delivery truck driver, his mother raising six children and working as a sewing machine operator in Lower Manhattan's garment industry. Needless to say, the working-class milieu in which Fasanella lived and worked played a significant role in shaping the form and content of his art. 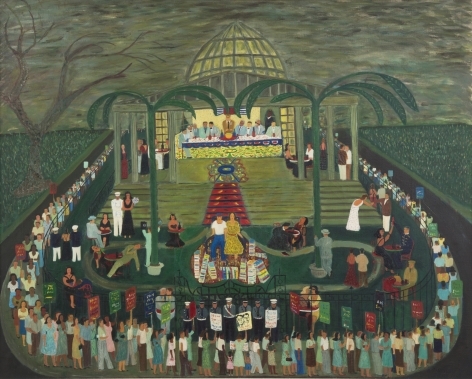 Ralph Fasanella: The Art of the Social Engagement, AFL-CIO Headquarters, Washington, D.C.
Russell Rotunda, Russell Building, Washington, D.C.
Acquisitions: 1974–1977, Hirshhorn Museum and Sculpture Garden, Washington, D.C.
Ralph Fasanella: A More Perfect Union. New York: Andrew Edlin Gallery. D’Ambrosio, Paul S. Ralph Fasanella’s America. Cooperstown: Fenimore Art Museum. Elias, Robert, ed. Baseball and the American Dream: Race, Class, Gender and the National Passtime. Armonk: M. E. Sharpe. Fleming, Maria, ed. A Place at the Table: Struggles for Equality in America. New York: Oxford University Press. Zandy, Janet, ed. What We Hold in Common: An Introduction to Working-Class Studies. New York: Feminist Press at the City University of New York. Green, James R. Taking History to Heart: The Power of the Past in Building Social Movements. Amherst: University of Massachusetts Press. Images: Pictorial History of Italian-Americans. New York: Center for Migration Studies of New York. Okun, Rob A., ed. The Rosenbergs - Collected Visions of Artists and Writers. New York: Universe Books. Wallock, Leonard. New York: Culture Capital of the World. New York: Rizzoli International Publishers. Gordon, Peter. Diamonds are Forever: Artists and Writers on Baseball. San Francisco: Chronicle Books. Kurtz, Bruce D. Visual Imagination: Art Introduction to Art. Englewood Cliffs: Pretice-Hall. Giordano, Joseph, ed. The Italian-American Catalog. New York: Doubleday. Foner, Philip and Reinhard Schultz. The Other America. Newbury Port: Journeyman Press. Bihalji-Merin and Nabojsa-Bato Tomasevic. 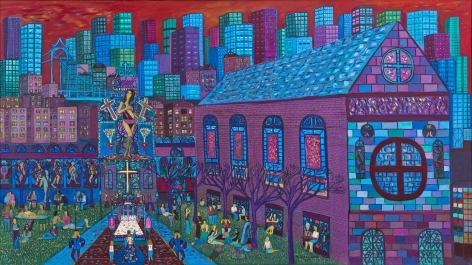 World Encyclopedia of Naive Art. New York: Scala Arts Publishers, Inc.
Chwast, Seymour and Steven Heller. The Art of New York. New York: Harry N. Abrams, Inc.
Foner, Philip and Reinhard Schultz. Das Andere Amerika. (German) Berlin: Elefanten Press. Johnson, Jay and William Ketchum, Jr. American Folk Art of the 20th Century. New York: Rizzoli International Publishers. Rodman, Seldon. Artists in Tune with Their World. New York: Simon and Schuster. Von Blum, Paul. The Critical Vision. New York: South End Press. Casewitz, Curtis W. Making a Living in the Fine Arts. New York: Collier Books. Foner, Moe. Images of Labor. Cleveland: Pilgrim Press. Pachter, Marc, Amy Henderson, Jeanette Hussey and Margaret Christman. Champions of American Sport. New York: Harry N. Abrams, Inc.
Rosenak, Chuck and Jan Rosenak. 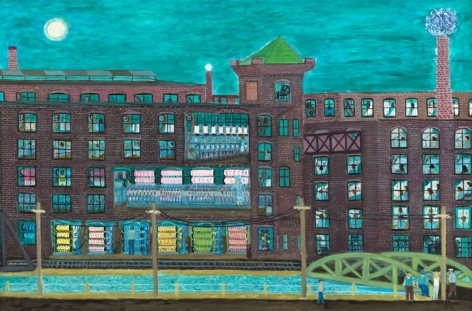 Museum of American Folk Art Encyclopedia of American Folk Art and Artists. New York: Abbeville Press. Berger, John. About Looking. New York: Pantheon Books. Bishop, Robert. Folk Painters of America. Boston: E.P. Dutton & Co.
Horwitz, Elinor Lander. 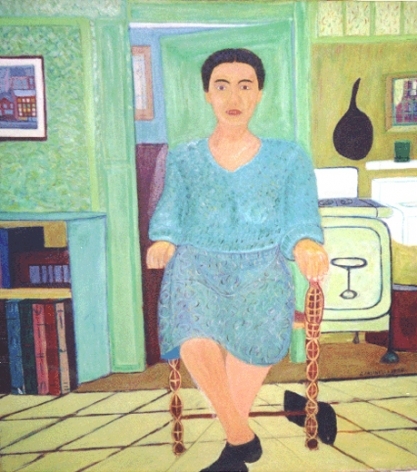 Contemporary American Folk Artists. Philadelphia: J.B. Lippincott & Co.
Hemphill Jr. Herbert W. and Julia Weissman. 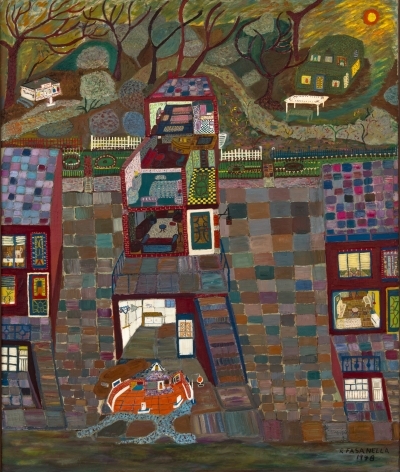 Twentieth Century American Folk Art and Artists. Boston: E.P. Dutton & Co.
Fasanella, Ralph and Patrick Watson. Fasanella's City. New York: Alfred A. Knopf. Rosenberg, Karen. 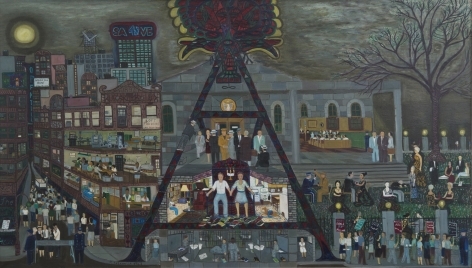 "The Working Class Made Colorful: 'Ralph Fasanella: Lest We Forget' at the American Folk Art Museum," New York Times, August 30. O'Sullivan, Michael, "Art Review: 'Ralph Fasanella: Lest We Forget'," Washington Post, June 5. Grimes, William, "Commute for Subway Art is Three Years, Door to Door," New York Times, May 6. Cotter, Holland. “American History, Sliced to Order,” New York Times, July 31. Fasanella, Marc. “The Utopian Vision of an Immigrant’s Son: the oil on Canvas Legacy of Ralph Fasanella, Italian Americana Art, Summer. Genocchio, Benjamin. “Bold, Colorful and Detailed,” New York Times, May 18. Saltz, Jerry. 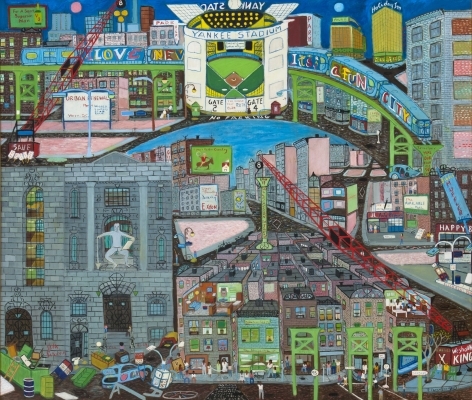 “Working Class Hero,” artnet, June 12. Glueck, Grace. “Where Nitty Met Gritty On Jampacked Canvases,” New York Times, May 31. Leduff, Charlie. “Neighborhood Report: City Lore; A Self-Taught Artist’s Blue-Collar City and What’s Left of It,” New York Times, March 24. Lombardi, D. Dominick. “Recalling the Life of Ralph Fasanella,” New York Times, August 13. Braff, Phyllis. “Works on Paper, With a Difference,” New York Times, February 20. Smith, Roberta. “Ralph Fasanella, 83, Primitive Painter, Dies,” New York Times, December 18. Gonzalez, David. “Making Art That Imitates One Man’s Life,” New York Times, May 14. 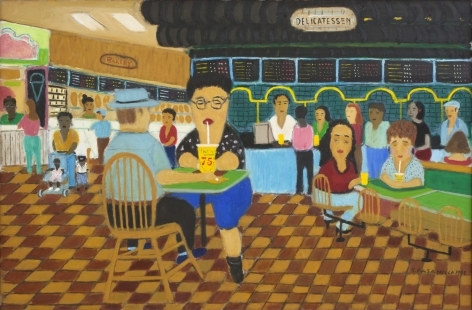 D’Ambrosio, Paul D. “Ralph Fasanella: The Making of a Worling-Class Artist.” Folk Art 20, no.2, Summer. Carroll, Peter. "Ralph Fasanella limns the story of the workingman," in Smithsonian, August, pp. 58-59. "The Street of Dreams," The New Yorker, Cover, May 31. Howe, Marvin. "Son of Immigrants, a Self-Made Artist May Arrive, Symbolically, on Ellis I.," New York Times, May 27. Nacelewicz, Tess. "Mill scenes strike a chord," The Lewiston Daily Sun, Lewiston-Auburn, ME, May 25. Rothenberg, Alex. 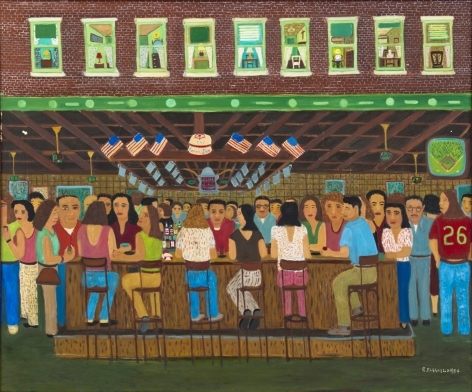 "Work pays off as Lawrence acquires strike art," The Boston Globe, May 2. CBS Sunday Morning with Charles Kuralt, November Diamonds are Forever Exhibit, including two paintings by Fasanella - "Night Game – Yankee Stadium" and "Sandlot Game"
United States Capitol Building, Washington, D.C.
liberal preferences, he sometimes found himself in favor, sometimes out of step. 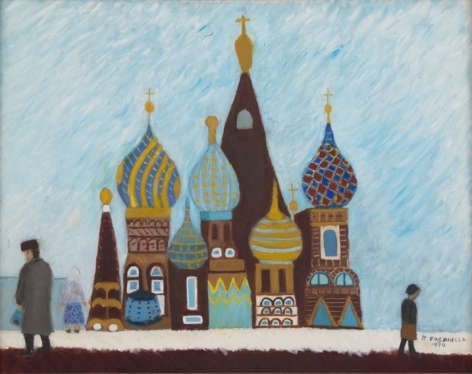 Yet he persevered, leaving an impressive body of several hundred canvases, many sketches, and broad respect and admiration from multiple spheres, including art and labor. At the beginning of his career and then again toward the end, Fasanella's celebratory images of the American working class, reformist politics, and a more egalitarian and just society were deemed out of sync and even dangerous. Today, as demonstrated by the surge of protest by groups like Occupy, and growing recognition of the abiding facts of American economic disparity, Ralph Fasanella's paintings are more revelatory, and relevant, as ever.